Luckily so far, every restaurant has been totally worth it. Plow's kitchen works like a machine, we take our seats at the marble breakfast bar and watch as the 3 chefs perform a cooking symphony. Meat man slaps my almond flour pancakes onto the flat top whilst egg man flips his fried egg like a crepe with minimal effort, garnish man has a bowl of crispy potatoes that look dangerously close to spilling free of the edge as he expertly adds fresh rosemary and seasons. 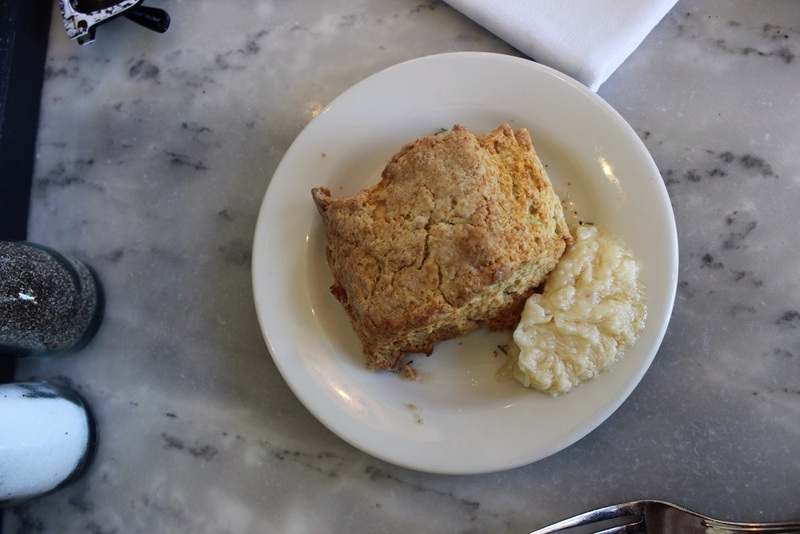 We had heard that the biscuits (that's scone to you and me) here were something to talk about and so we shared one with a puddle of honey butter. This scone is not smooth and round like we do them back home, but more rustic and misshapen, it's crumbly texture is heavenly light with the honey butter providing all the sweetness, a sprinkling of rosemary works really well with the honey flavour but looked like it was possibly an accidental spill? 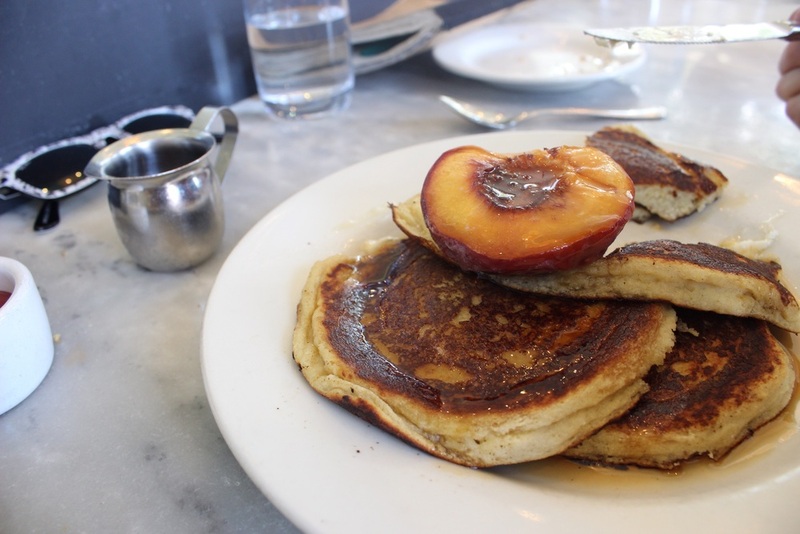 My golden pancakes are doused in maple syrup and topped with a slow roasted peach , they look overwhelmingly massive but without the gluten they are easily gobbled up. Steve has a plate with blood sausage that is quite like a black pudding only meatier, he has buttery ribbons of scrambled egg topping a slice of freshly baked sourdough toast and a side of Plow potatoes that exceed expectations even after watching garnish man's skills, each one is that perfect crispy bit you reach for in the roasting tray, expertly seasoned and a soft fluffy centre. 'Four Barrell' is definitely stand out to your average coffee shop. It is actually a fully working coffee roasting factory, they have just decided to add a counter and tables so you can sample the goods. A whole corner devoted to a drip coffee bar with a selection of bean options is a deliciously smelling novelty. This place is an experience in itself before you even try the coffee, sounds of the roaster and some old school vinyl sooth the soul as you sit with a thick stoneware mug and sip coffee so smooth, I can only describe it like a hot melted ice cream. Chicken for 2.... Or 4, we had to doggy bag. 'Zuni cafe' was recommended to us and we thought we may feel a little uncomfortable in such a smart restaurant where the servers are in bow ties and waistcoats, but we soon realised that this place is not pretentious. We ordered another recommendation, the roast chicken bread salad for 2. This dish takes a minimum of an hour to cook as they roast it whole in the beautiful brick oven that sits slap bang in the middle of the dining room. We eagerly watch the chef manning it with a terrifying focus in his eyes. 60 to 80 chickens they can get through in one day and let me tell you why. This meal is so simple and that is why it works so well, the golden chicken is cut to 8 portions and we push our cutlery aside as let's face it, you look like an idiot trying to cut up a drumstick. The chicken is so incredibly juicy and tender beyond belief, falling off the bone with a kiss of smoky flavour from the oven. It is served a top the salad of fresh green leaves and hunks of bread that have been soaked in olive oil and chicken juices, then roasted with the skin of the bird until crisp. When ordering dessert we try never to get the same as each other, but it was too late because we had already seen the 'gateau victoire' leave the kitchen. Our waitress had a job understanding that we wanted 2 slices ( I do not need to feel guilty about my dessert..) I would have had 4. This chocolate cake is so deceiving, it feels like a mousse as you cut through it but turns into a devilishly dense brownie texture in the mouth. Georgia is currently lost to the world and floating in her chocolate cake bubble whilst I am trying to justify my mountain of whipped cream by convincing myself that it is really just mostly air. 'Tartine' bakery is on a standard street corner in San Francisco, yet there is another bloody queue running round the side of the building. It's ok, you need to join this queue. 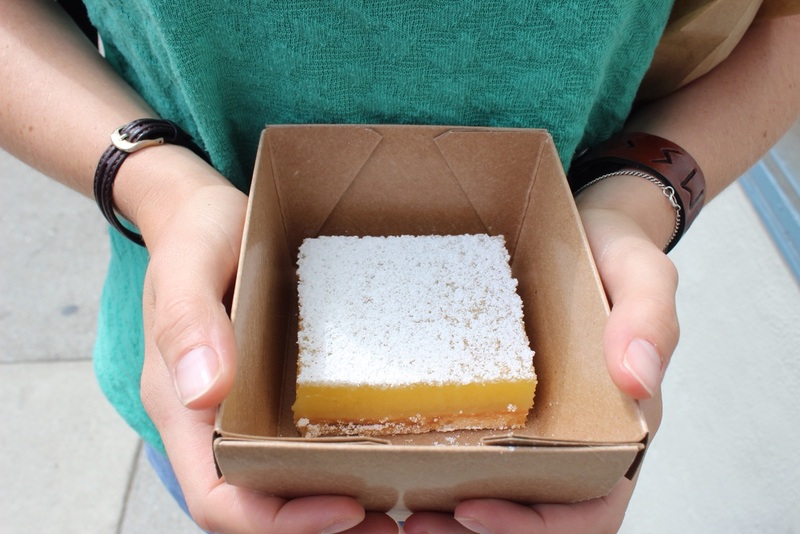 I was watching a guy juicing about 100 lemons in the kitchen when I saw the lemon bar slice that I knew had to be tried and compared against my own ' gooey lemon bar' creation. Thick and filled with zesty pow this bar really packs a punch, the pine nut shortbread base adds a delicate nutty flavour and overall gives a deep satisfaction to my breakfast belly rumbling..I'm not admitting that this is better than my own recipe but you'll all just have to come try it for yourselves. The pain au chocolate was basically double chocolate which never seems to happen and was welcomed extremely quickly into Steven's mouth without even offering anyone else a taste. After the lack of sign fiasco I have some tips for you guys as you will be needing to come here! Don't order anything from the menu and to be honest, don't even look at it. I'm serious! 'State Bird & Provisions' is a place where all your trust should be given to the chefs. They cook what they like and over the course of the evening, small dishes are offered to you by enthusiastic servers, all you have to do is sit back and say Yes or No. Not quite as easy as it seems, you feel like you're personally rejecting a marriage proposal everytime you look into the waiter's eyes and say 'no thank you' to a plate of perfection. After a few minutes and with my birthday drink in hand, dishes start flying around the restaurant. As it was my big day, we might have over done it on the amount of food we accepted and I'll be here forever if I were to describe everything so, here's a few highlights. First out came a beautiful shredded Guinea hen dumpling, in a pool of crystal clear aromatic broth. I'm not sure anyone should ever try to portion a dumpling for 2, but Georgia expertly cuts it in half and devours it within seconds. The small restaurant suddenly fills with the smell of garlic and I soon found out why, crispy on the outside, yet chewy and moist on the inside, our doughnut like garlic bread was made even better with the addition of a creamy burrata . Next came a delicate quenelle of duck liver mousse with tiny, sweet almond friands that were a perfect flavour combination. We ticked off our 'Frisco bucket list' with a 'Hog Island Oyster', topped with a sprinkle of sesame and spicy sauerkraut, these guys know how to ignite the passion. So the plan was to supposed to involve, heading to a nearby bakery to grab some cake for my birthday, but I quickly changed my mind after reading the dessert menu. A sweet and slightly salty goats milk ice cream sandwiched between two chewy sesame macarons, a splash of colour and zing from the accompanying spoonful of roasted strawberry compote. Our other dessert was quite special, melting nuggets of coffee ganache under a vibrantly fresh blueberry compote, sprinkled with a roasted pecan crumble, the final master stroke was a creamy Szechuan pepper marshmallow, blow torched for a meringue finish. The waitress describes it as 'a smore on acid'. It's the type of dessert that makes everyone at the table go silently off into their own happy place. This pudding is now in my top 2 of all time, if that's not incentive to visit, I don't know what is. We come to the end of our San Fransisco trip, not before encountering an elderly man walking down the street wearing nothing but a sock...fortunately it's not on his foot...just lovely.